ATX StandUpPaddleboards - Venture Sport, Inc. IT IS IMPORTANT TO KNOW: All SUP ATX Paddle Board models are designed to work fine for ALL Stand Up Paddlers; whether you’re male or female, small or large, tall or short, young or old, a beginner or highly skilled, and whether you plan on paddling flat water or surfing waves or wakes. With that said, SUP ATX offers a wide variety of models to give you the opportunity to choose a paddle board that will best fit your particular interests. Here are a few things to consider in choosing which SUP ATX is best for you…. – The longer and wider the paddle board, the more stable it will be in flat water ie: lakes, bays, calm water, distance paddling in the ocean, but keep in mind longer boards can be used to surf waves, as well. This is why our Journey, Adventure and VR1 Models are the BEST ALL-AROUND CHOICE for a first paddle board. – The shorter the paddle board the better it will be for surfing waves in the ocean or surfing a boat wake, but keep in mind shorter boards are fine in paddling flat water conditions, as well. This is why our Escape, Freedom and SR7 Models are great for intermediate paddlers or as a second board. – A single, longer fin is better for maintaing a straight line while paddling. Our Journey, Adventure, LR, HR and Yoga models all have single fin configuration. surfing waves or boat wakes. Our Freedom, Escape and SR7 Models have the tri-fin configuration and are shorter boards, making them best for more skilled paddlers. Because the Freedom, Escape and SR7s are smaller boards, they are also great for children. – A board with the entire top surface covered with EVA/memory foam is great for taking along children, pets and for exercise/yoga. The entire top surface of all Adventure, Yoga and HR Models are covered with EVA-Memory foam. 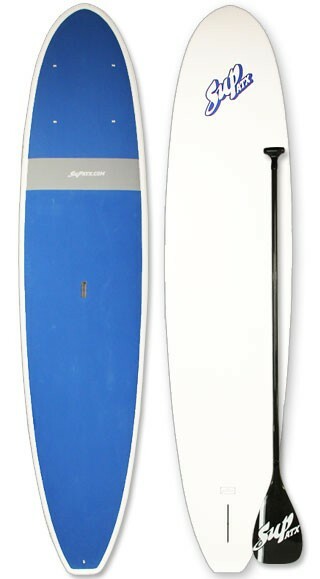 Durability and stability are the focus of the SUP ATX Journey line of paddleboards. This model features a functional shape that preforms as well in the coastal surf as it does in lakes, rivers and inland waterways. Cellulose lamination and molded blank technology promise that the Journey will provide years of SUPing for the whole family. Board Weight: 11′ = 28 lbs. | 11’6″ = 29 lbs. | 12′ = 30 lbs.